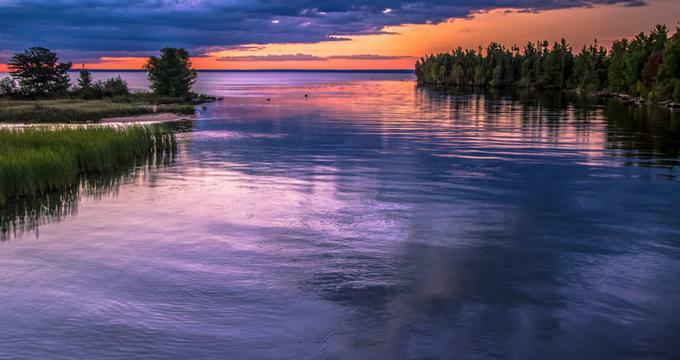 Explore some of Michigan's most beautiful destination on your weekend trip from Detroit, including Ann Arbor, Saugatuck, Kalamazoo and other vacation spots. Our list includes romantic ideas for nearly every budget, including elegant mansions, historic inns and affordable B&Bs. 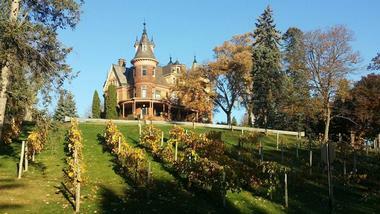 Located in the historic West Main Hill neighborhood and overlooking downtown Kalamazoo, the Henderson Castle Inn is a dream from a whimsical fairytale built by Frank Henderson in 1895 for his family. 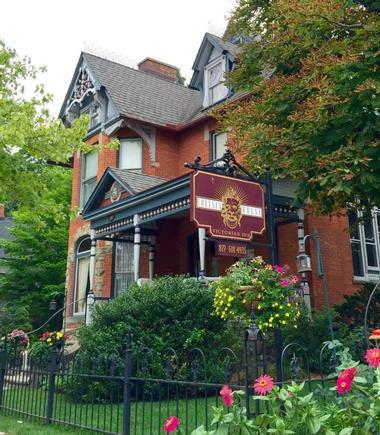 A short walk from the Kalamazoo Institute of Arts and the Kalamazoo Valley Museum, this upscale award-winning inn offers ten luxurious rooms and suites as well as a cottage with a kitchen and living space - it is perfect for a family or those who are enjoying a longer stay. Opulent rooms have luxurious amenities such as marble floors, private balconies, crystal chandeliers, hand-carved bedframes, hand-painted ceilings, stained and leaded glass windows, private bathrooms, free Wi-Fi, and cable TVs. Guests also enjoy a sauna and a luxurious hot tub on the rooftop. There is an upscale French restaurant on the premises for a full breakfast, which is included, or for lunch and dinner. The Queen's Residence is an 1870 French country-style inn in the picturesque Ann Harbor area in the charming village of Ypsilanti. It is only a short walk to the Waterworks Park and The Ypsilanti Historical Museum. Each of the five lavishly decorated rooms and suites have individual climate control, a private bath, TVs, and DVD players, and many have fireplaces, four-poster beds, and working desks. A gourmet breakfast is provided in the dining room. The Wild Turkey Travelers Tavern, an authentic historic 1700's Colonial inn and tavern, is located on the lower level. A lovely flowering garden filled with pots of roses and annuals, small charming fountains, and cozy benches surrounds the establishment. Chelsea House Victorian Inn is a beautifully restored 1880s Queen Anne Victorian house located on the main street of downtown Chelsea, a quaint small town with lovely galleries, restaurants, and shops that are just minutes from the Inn. All the rooms are beautifully decorated with original antique pieces and precious art and feature private modern bathrooms, cable TV, and free Wi-Fi. Some of the rooms have lovely intricate fireplace sand claw-foot tubs. The carriage house next door is perfect for those who require more privacy, as it has its own deck, kitchen, bath with Jacuzzi, and a spacious living room. Guests in the main house can have their lavish gourmet breakfast in the dining room and enjoy spending some time in the elegant sitting room or lush flowering gardens. 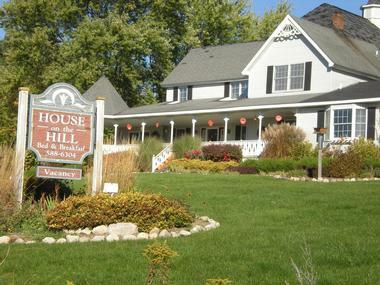 Located in the meticulously renovated 1896 farmhouse overlooking north Michigan's Chain of Lakes, the House on the Hill is an upscale bed and breakfast set on 53 beautiful acres about 11.5 miles from Charlevoix. 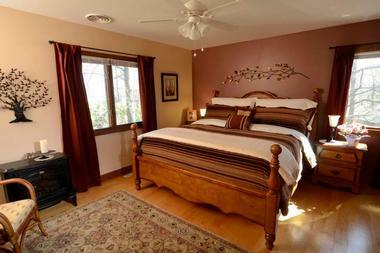 Five cozy, nicely furnished rooms in the Main House all have private baths, free Wi-Fi, and king or queen size beds. Some even have four-poster beds. Three carriage house rooms also have fireplaces and decks. A three-course gourmet breakfast is offered on the front porch, and there are free snacks and soft drinks throughout the day in the 'guest center'. Guests are invited to use kayaks, paddleboards and canoes free of charge. 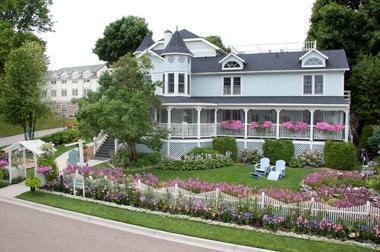 Conveniently located on Market Street in Mackinac Island's historic district, Metivier Inn is a distinct pale blue Victorian B&B built in the mid-19th century. It boasts large porches and a quirky turret surrounded by magnificent French country gardens, and the cozy, lovely rooms are all individually decorated in a romantic mix of French and English country styles. Just a couple of blocks from the heart of the charming village of Allegan, DeLano Mansion stands as glorious reminder of its genteel past. This beautifully restored 1863 Victorian Inn has six large suites furnished with magnificent antique furniture and period art pieces and overlooks the meticulously landscaped gardens. Just next to the DeLano Mansion is the Allen House from the same period, and it offers three additional artfully appointed rooms. Only five minutes from the Grand Rapids' lively streets and less than 20 minutes from the Lakeshore and six miles from John Ball Zoological Garden, Prairie side is an award-winning upscale B&B with eight opulent suites that range in décor from traditional to country to sleek and modern. All suites have free Wi-Fi, flat screen TVs, private bathrooms, kitchenettes, fireplaces, and in-suite whirlpool tubs. Several have private entrances or decks. Guests have three options for breakfast, and they can be served in the inn's elegant dining room or in guests' suites. There is a lovely garden with an indoor pool to enjoy before or after exploring the area. The Grand Victorian Bed and Breakfast Inn is located inane 1895 mansion considered to be one of the perfect examples of ornate Queen Anne Victorian architecture. Only two blocks from the Cedar River in Bellaire and a short drive to Torch Lake, the magnificent house greets guests with six luxurious and beautifully appointed rooms, four in the Main House and two more in the Carriage House next door. All rooms have lovely antique period pieces and décor, en suite baths, and free Wi-Fi, and some have fireplaces and Jacuzzi tubs. Guests can enjoy the lovely parlor, outdoor porch and elegant dining room where hot breakfast is served in style on fine china and crystal. Located on the coast of Lake Huron between Oscoda and Tawas, the Huron House is an upscale and award-winning couples-only retreat with 14 luxurious rooms and all modern amenities. All rooms overlook vast Lake Huron, and guests can fall asleep listening to the soft waves and step out to the beach right from their rooms. Stone Chalet is an upscale, elegant B&B located in one of Ann Arbor's quiet residential neighborhoods in the downtown area. It is near the Central Campus of University of Michigan and is just a short walk from the Ross Business School and Michigan Stadium. The inn consists of four buildings that host guest rooms and event spaces. 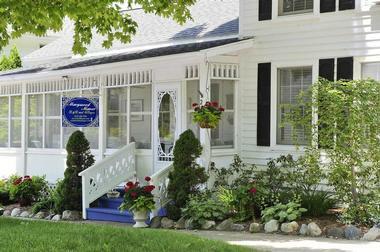 Wickwood Inn is an elegant boutique inn in downtown Saugatuck, just a short drive from the Oval Beach and Saugatuck Dunes State Park. Eleven chic guestrooms feature designer décor, en suite bathrooms, air-conditioning, down comforters, and original artwork. Suites also have fireplaces. Guests are invited to enjoy living rooms with large fireplaces, a library, and a spacious dining room. When the weather permits, guests can dine on the porch and relax in the pleasant gazebo surrounded by lush gardens filled with hydrangeas and boxwood. A gourmet homemade breakfast in the morning, free drinks and snacks during the day, and wine tastings with hors d'oeuvres in the evenings are all part of the exceptional experience of staying at the Wickwood Inn. Located in downtown Saugatuck close to all the restaurants and shops, Marywood Manor is a historic 1886 Four Square Colonial Farmhouse that has been turned into a lovely small inn. The charming establishment surrounded by beautiful, lush perennial gardens, and it offers four brightly colored romantic suites with queen beds, fine linens, large living rooms, small refrigerators, cable TV, free wireless internet, a private bath with a shower, and a private porch with swing. Guests are invited to enjoy the full homemade breakfast on the large screened porch overlooking the garden. Beach chairs and towels are provided. 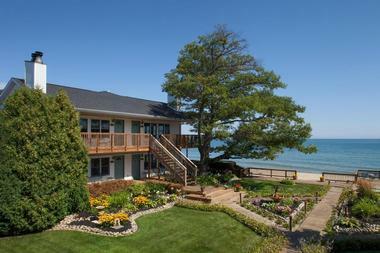 The Arcadia House is a comfortable retreat located on the shores of Lake Michigan. At the Arcadia House, each guest room has a private bath and free wireless internet, and guests can enjoy an outstanding complimentary breakfast. 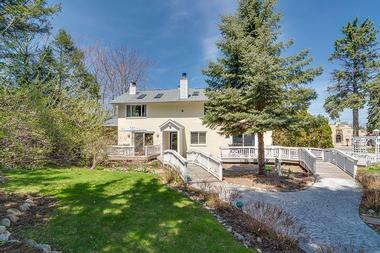 There is also a two-story, three-four bedroom carriage house that larger groups can rent. Other amenities include an outdoor hot tub and massage therapists on-site. 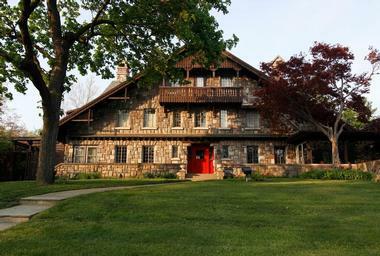 The Arcadia House is adjacent to the Sleeping Bear Dunes National Lakeshore and is also close to the Arcadia Bluffs Golf Course and the Crystal Mountain resort. Fishing, boating, hiking, shopping, and restaurants are all nearby. The Hexagon House is a historic Victorian bed and breakfast with an unusual shape! 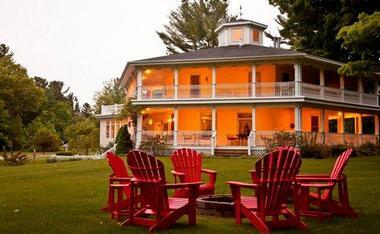 The inn sits on three beautiful acres in the Village of Pentwater, on Pentwater Lake. Rooms include private baths, individual climate control, and cable television, and guests can also take advantage of a gourmet breakfast and complimentary snacks and coffee. The inn has plenty of places to relax, including long railed porches, an outdoor fire pit, and an indoor parlor and great room with books and movies. The Pentwater Lake area is known for beautiful beaches in the summer, colorful landscapes in the fall, and skiing and ice fishing in the winter. At the New Buffalo Inn and Spa, guests can relax in a luxurious Southwestern Michigan hotel located within walking distance of restaurants, casinos, historic sights, and beautiful scenery. 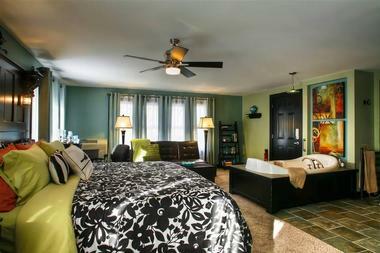 Each guest room has a gas fireplace, cable TV, DVD player, complimentary wireless internet, and a private bath. 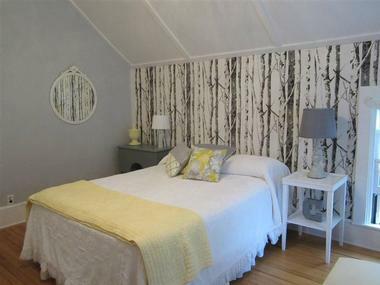 Guest rooms are available for two adults, and families can stay in a larger cottage. The New Buffalo also offers an on-sight spa with a full range of massage, beauty, and healing treatments. You can purchase special massage, romance, and getaway weekend packages when booking a room. Originally built in 1886, The Carriage House is a sprawling mansion located on the shores of Lake Michigan in South Haven. Comfortable guest rooms include amenities such as private baths, cable TV, DVD players, spa-quality toiletries, and plush bathrobes. An unforgettable gourmet breakfast is served each morning in the dining room or on the screened porch. Guests of the Carriage House can enjoy beautiful views of the landscaped grounds and nearby harbor while munching on complimentary snacks such as popcorn and homemade cookies in the afternoon. Nearby activities include boating, fishing, restaurants, antiquing, and apple-picking (in season). 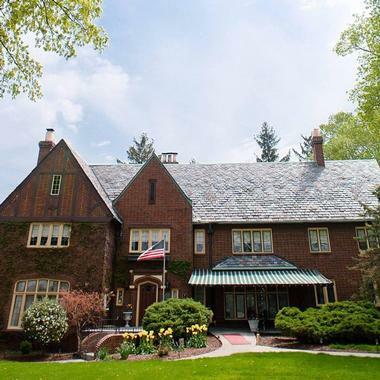 Guests of the Seymour House will enjoy a relaxing stay in a historic home situated on eleven acres in Western Michigan. 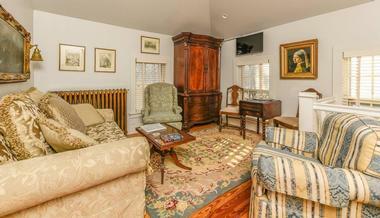 They can stroll the nature trails, fish in the stocked pond, or enjoy a book or movie from the inn's library. The Seymour House contains five guest rooms, all with fireplaces, private baths, and a view of the grounds. Some rooms also have Jacuzzi tubs. A rugged two-room log cabin is also available for rent. After enjoying a delicious home-cooked breakfast, guests can explore the nearby shopping, dining, golf courses, beaches, and farmers' markets. Relaxation, romance, and luxury all abide at The Kingsley House, where guests can relax in spacious suites with private baths, large comfortable beds, cable television, complimentary snacks, and wireless internet. Some suites also include Jacuzzi or whirlpool tubs and terrycloth bath robes. A full gourmet breakfast is included with all room bookings. Romantic getaways are the Kingsley House specialty, and special romance packages with flowers, massages, and complimentary wine can be booked for an additional fee. 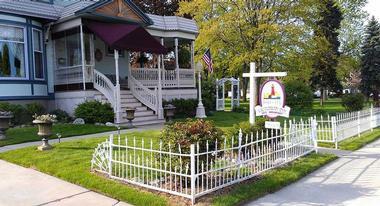 The inn also provides bicycles guests can use to explore the town of Fennville and the beautiful Michigan countryside. 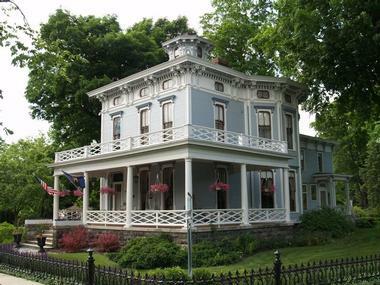 Located on the Muskegan Lake Bluffs, the Port City Victorian Inn is a stately Victorian-era mansion featuring period woodwork and decor. The inn's five spacious guest rooms contain beautiful period furnishings, private baths, and flat-screen televisions, and guests can enjoy a delicious breakfast each morning. The inn also offers special romance and activities packages for an additional fee. 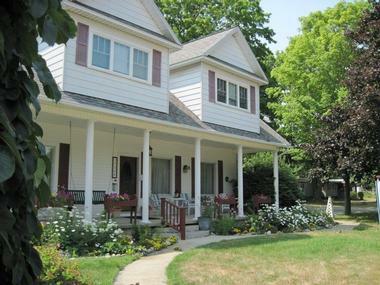 The Port City Victorian is close to fishing and biking opportunities, museums, historic sites, and the beautiful sandy beaches of Lake Michigan. The inn's friendly staff is always ready to help guests find local attractions and make the most of their trip to Michigan. 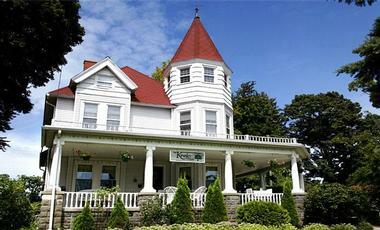 This stately bed and breakfast sits high on the bluffs overlooking beautiful Torch Lake in Northern Michigan. Guests can enjoy breathtaking views of the lake and scenery from one of the inn's porches or decks. At night, the decks are the perfect place for stargazing. Inside, the inn features four suites, all with private baths, toiletries, flat-screen TVs, free wireless internet, complimentary snacks, and a delicious breakfast each morning. The inn also provides guests with paddle boards, kayaks, and snorkel equipment for use in Torch Lake. Shopping, dining, boating, hiking, and sea plane tours are all nearby. 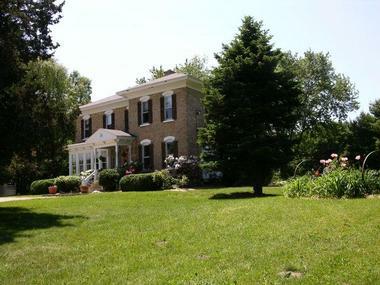 The English Inn is an upscale bed and breakfast located half way between Eaton Rapids and Lansing on 15 acres of countryside with a swimming pool, original pergola, whimsical gazebo, fishpond, perennial and annual gardens, and winding nature trails. 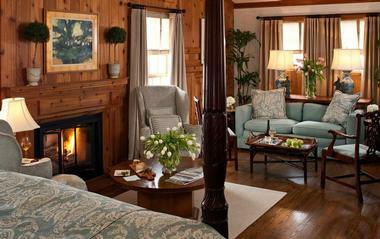 The inn boasts period antiques, enormous fireplaces, and finely handcrafted wood. Six luxury rooms and three charming cottages are beautifully decorated and have private bathrooms and cable TV. Some feature antique four-poster beds, chandeliers, whirlpool tubs, and dining areas. Breakfast is served in the elegant dining room, and guests can enjoy an on-site fine restaurant and a traditional English pub. Cross the footbridge and follow the path to the Bridgewalk, a historic mansion located in Central Lake, Michigan. The large windows, high ceilings, and elegant woodwork in the Bridgewalk Inn reflect the Victorian period in which it was built. Guests can relax on the porch swing or curl up by the fireplace with a good book, or they might want to spend time in their rooms, which include private baths and air conditioning. Guests can also have a complimentary homemade breakfast each morning. The Bridgewalk is located just two blocks from Intermediate Lake and is just a quick drive away from Torch Lake and Lake Michigan. Several nature preserves are also nearby. Surrounded by 110 acres of picturesque vineyards, apple orchards, and green fields and only minutes from Lake Michigan and downtown St.Joseph, Dove Nest Bed and Breakfast offers a perfect retreat for tired travelers and a jumping-off point for exploring the beautiful area. Four spacious rooms and a luxury suite are beautifully decorated in a cozy country style and feature all modern amenities such as private bathrooms, free Wi-Fi, and cable TVs. A lavish gourmet breakfast is the pride of Dove Nest, and it can be enjoyed in the comfortable dining room or, when weather permits, on the deck overlooking gardens while listening to the birds. The Wellington Inn is a stately neo-classical mansion in Northern Michigan whose interior has been restored to its original condition. The inn features period décor and antiques throughout and contains nine guest rooms, as well as a carriage house with two apartments. Room amenities include private baths, some with pedestal or jetted tubs, fireplaces, cable television, and wireless internet. A delicious breakfast is served each morning, and complimentary snacks and beverages are available throughout the day. The Wellington Inn is located in the beautiful downtown area of Traverse City and is within walking distance of shopping, restaurants, parks, and the Boardman River.